There are two ways of tacking down a folded-over band. One way is easily done with knitting needles--today's post. The other way (cue scary music!) requires a sewing needle--that's the next post. 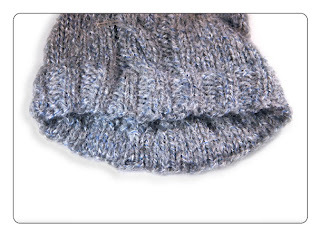 The knitting needle method of knitting shut hems is similar to a 3-needle bind off. The stitches in the first row of the hem or facing are knitted together with the stitches in the last row of the hem or facing. 1. (below) LOOSELY cast on the hem using the long tail method or the long tail method for LOTS of stitches (casting on is shown in red, below). 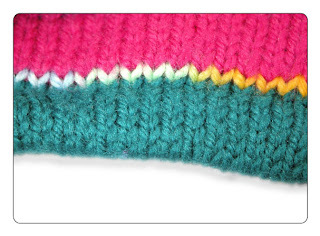 Work the ribbing (shown in green, below) to TWICE the desired height. Arrange to finish your hem so that the long tail cast left over from the casting-on is on the left, and the running yarn (shown in blue, below) is on the right, as shown below. 3. (below) Hold the cast-on stitches on their light blue needle at the inside "behind" the live stitches on their purple needle. As you can see, the cast-on stitches on their light blue needle present LEFT arm forward when they are held inside-out behind the live stitches on the purple needle. Use a third needle (the golden needle in the illustration below) to knit together each live ribbing stitch with the cast on stitch held behind it, as shown below. 4. (below) The finished product: the "knitting together" row is shown in blue, the cast-on stitches which are caught into the back of the hem facing (the "inside" of the hem) are shown in red, the balance of the fabric in green. Of course, in real life, the row of live stitches in front and the cast row behind would be the same color, and the cast-on row would therefore not show on the front of the fabric, unlike the red cast-on stitches in the illustration below. The finished product "in the wool" is shown in the photo at right. By knitting the top and bottom of each column of ribbing together in this manner, the hem is fastened down in a folded-over manner, and no sewing is required. However, as slick as it is, this "knitting needle method" of shutting hems and facings has a limitation. Q: Why do you use a long tail cast on, instead of a provisional cast on for this trick? A: Many knitters (most knitters, probably) DO use a provisional cast on, as follows: Remove the provisional cast on and put the live loops on the second needle (the light blue needle in the above diagrams). Holding the live loops at the back of the hem, use a third needle (the golden needle in the above diagrams) to work together a stitch from the front of the fabric (on purple needle in above diagrams) with a live loop from the back of the fabric, using the same method as shown above for long tail. NOW: despite the fact that most knitters DO use a provisional cast on for this trick, the reason I DON'T is that the live loops created by the provisional method have a nasty tendency to run out. To explain further: Near the end of the row, the needles holding the stitches, especially the rear needle (light blue) want to slide out because there are very few stitches left to hold them in. When the inevitable happens, and the rear needle slides out with only a few stitches to go, I don't have to worry: because my rear stitches are secured by the long tail cast-on, when those rear stitches come off the needle, they can't run because (ta da!) they aren't live stitches. Q: What about the fold line? Are there any tricks for that? Q: Any other tricks with a hem? A: You bet! A knitted hem is a tube--and you can run a drawstring or an elastic through it. Socks made with an elastic garter in the hem will simply not fall down--nearly all my socks are made this way--including the one in the previous illustration. Here is an entire post about elastic in socks. 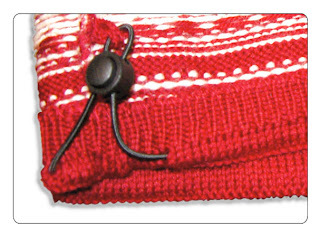 Another trick: As shown on this commercially knitted sweater, right, you can run an elastic drawstring through the hem--a good idea for a heavy outdoor sweater to be used in sporting or working conditions--shown is a ski sweater. Next post: SEWING down the hem on the inside. PS: Addendum October 2014: Since this post was written, some valuable comments have been left by readers...maybe take a look? You have been reading TECHknitting on knitting shut hems.